The Thirty Year Itch: Monkey Murder Mayhem! Today I went to the Cleveland Metroparks Zoo's Rainforest exhibit with my family. This is nothing new; we've been members of the Zoo for four years and go regularly. Today, however, we witnessed something truly blog worthy! Just before we were about to leave, I was looking at an exhibit of Pied Tamarin monkeys. I saw one with some babies on its back. I called my wife and two young children to come and see them. We saw a notice on the information card that the babies were born on January 15, 2012, making them eight days old! I took a picture with my mobile phone (one of the few times going to the zoo without my camera) and was posting it on Facebook when my wife said that another monkey grabbed one of the babies and was hurting it. I looked, and it appeared that an adult monkey was trying to kill the baby. My wife alerted zoo staff, and within minutes several zookeepers arrived, but unfortunately, it was too late, and the baby had been killed. The zookeepers got the dead baby away from the killer monkey, but didn't separate the second baby from the rest of the group. I asked one of the zookeepers a few questions. I was told the babies were on the father's back, and the one that killed the baby was the mother. Although saddened by what happened, I didn't question it much; nature, right? 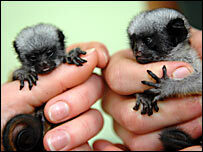 I know there are species that kill their young, and supposed the pied tamarin monkeys were one of them. After the baby died, the zookeepers disappeared. I was in the gift shop when my wife came back and said the second baby was now being killed! Again, she went to the Zoo staff and reported the attack, and the zookeepers returned, again, too late. After the second death, I wondered why they didn't segregate the second baby. Since I don't know much about zookeeping or pied tamarin monkeys, I thought the staff at the Zoo knew what they were doing. Or maybe the Zoo has a policy about not interfering with the natural parenting of their animals. 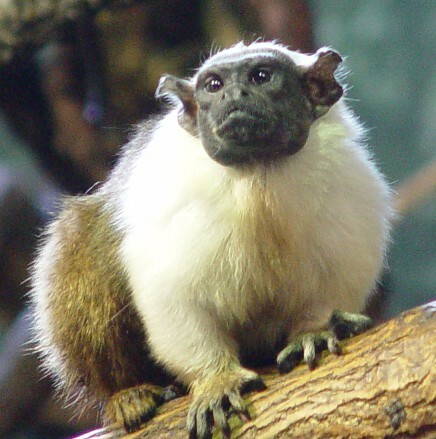 Maybe there has never been an incident of raising a baby pied tamarin monkey without its parents, so separating it wasn't an option, since it would inevitably lead to death. Again, I'm not an expert in zoo-keeping or animal husbandry, so I didn't give it too much thought. But when I heard from my wife a few hours later that the pied tamarin is on the endangered primate species list, I thought a little more. Why, after the first baby was killed, would Zoo staff do nothing to protect the second one? 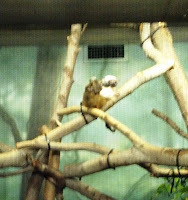 I also learned, with only a few minutes of research, that these kind of monkeys are cared for mostly by the males in the group, only turned over to the mother for nursing. They live in groups of between 4 and 15, with one alpha female, who, typically, is the only female allowed to breed. Infanticide is not unheard of, often a dominant female killing the babies of other breeding females in the group or when the mother is stressed and competing with other females. Infanticide in tamarin monkeys occurs when mothers feel competition with other females or they don't have enough help and support from the group in the care of their young. One study indicates that 80% of infants die if there are two gestating females in the group; only 20% if there is only one reproductive female. Also, 75% of infants survive to adulthood when there are at least three males helping; only 41.7% survive if their are only one or two males to help. In fifteen minutes of research, I learned enough about these monkeys to know that several steps should be taken to help prevent the likelihood of infanticide in this endangered primate. First, don't house more than one gestating or competing female with the mother and babies. Second, be sure that, in addition to the mother, there are three or more males available to help with caring for the young. 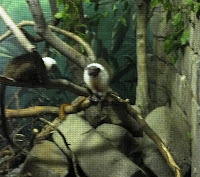 Perhaps the zookeepers took these steps, and more, to prevent the death of the pied tamarin babies. But given the results, perhaps they didn't. I thought for sure you where talking about the conservative voting base in this country, Real monkey's though - that's sad. What a shame! And now I see they're giving other monkeys birth control!